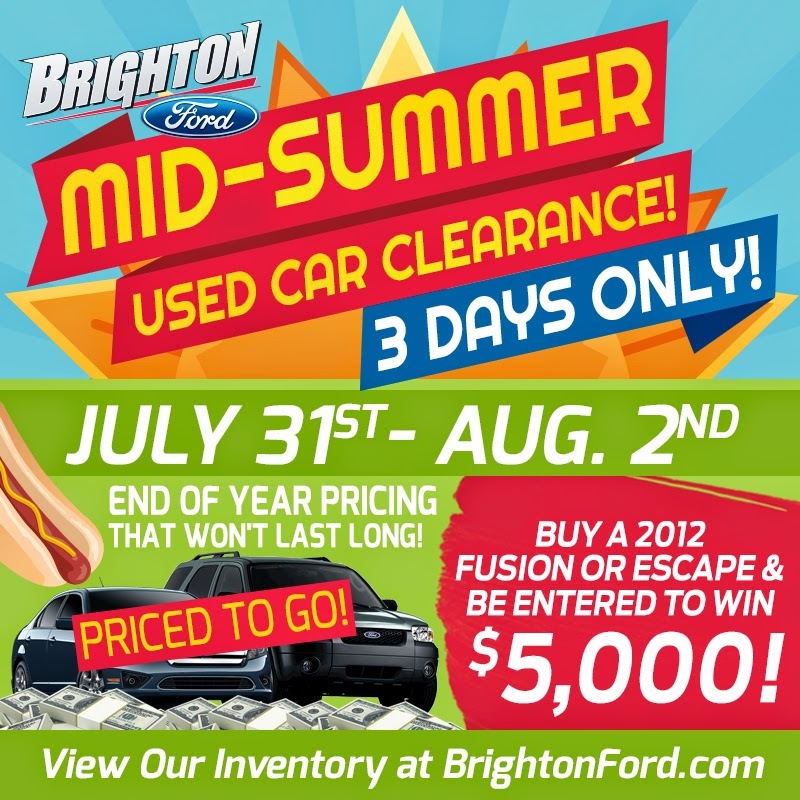 Brighton Ford : Mid-Summer Used Car Clearance at Brighton Ford in Brighton, MI! Mid-Summer Used Car Clearance at Brighton Ford in Brighton, MI! BRIGHTON, Mich - Get ready to take advantage of end of the year pricing on a variety of top quality used vehicles at the Mid-Summer Used Car Clearance at Brighton Ford in Brighton, MI! We have priced our vehicles to go for this 3 DAY ONLY SALE starting on July 31st through August 2nd. Not only are we giving you unbeatable prices on all previously owned and used vehicles, but we are giving those who purchase a 2012 Fusion or Escape a chance to win $5,000! Don't miss the Mid-Summer Used Car Clearance at Brighton Ford in Brighton, MI! From July 31st until August 2nd, you will get end of the year pricing on any of our used vehicles. Remember, if you buy a 2012 Fusion or Escape, you will automatically be entered to win $5,000. Come on, we know you are already thinking about what you can do with that extra cash! Questions about our Mid-Summer Used Car Clearance? Feel free to contact us at (810) 836-8206 and one of the members of our staff would be happy to help you. Brighton Ford is located at 8240 Grand River Ave. just north of I-96 in Brighton. We are a family owned and operated business that strives for customer satisfaction. For more information on Brighton Ford visit BrightonFord.com.